A continuation of my Fire Tower Tour Part 1 from earlier this year will have me finding three former fire tower sites, and two relocated fire towers. I started out picking Dad up in Pulaski, and then headed up to Watertown to our first stop, the Thompson Park Zoo and the relocated New Boston fire tower. After paying admission, we followed the trails back to the tower, passing such wildlife as lynx, elk, and other animals, eventually coming to the tower itself. There are some descriptive signage, explaining the history of the New York fire towers and the work put into refurbishing this one. But it appears to have been closed to climbing for several years now. After checking out some of the other animals, we left and headed east to the former Bald Mountain fire tower site, in the Oswegatchie Conservation Easement, not to be confused with the “Bald/Rondaxe Mountain” near Old Forge. In the 2006 master plan for this area, there was mention of putting in a trail, but recent pictures and reports showed nothing was done, so it was going to be a bushwhack. And very little information online about it, but I did find a book that explained it, Discover The Northwestern Adirondacks. Using that, and checking several maps, we got to the pull off mentioned in the book to start our hike. Across the road I spotted what looked like a herd path going into the woods. There’s a lot of old logging roads, filled with pricker bushes, crossing all over the place. And on some trees there were orange blazes, maybe from when they were planning on putting in a trail, since we’d come across them quite a bit. After about a quarter mile and getting close to the summit, we came across some cliff/rocks, that we had no interest in trying to climb, instead we headed left, going around this area and reaching the summit from the back side. Once at the summit, there was evidence of it’s former use, like cement supports from the former cabin, holes in the ground where they dug them up (watch your step), part of a stovepipe, and brackets from the former tower. If you head to the left (south) on the summit, there’s a slightly open area to look towards the foothills of the Adirondacks. It should be a nicer view once the leaves are down. Headed back down, overall with spending time at the top, only about an hour total. Next stop was the former Number Four fire tower site. But on the way we spotted a nice looking pond alongside the road, Rock Pond. The area around there is used by the Oswegatchie Educational Center. Continuing on, we went to the Independence River Wild Forest and site of the former Number Four tower. This one would be an easy hike from the first camp site along the road. At the back of the site there is a trail that takes you right up to where it used to stand. A couple hundred feet and there it is. And if you go a little past the site, you can find the summit marker. After checking it out some, we then headed off to the DEC Lowville Demonstration Area, the new home of the Number Four Fire Tower. It is not the complete tower, the original was 90 feet tall, currently it’s approx 25 to 30 feet tall. It is also home to the former Gomer Hill Observers Cabin, where we went to on the last Fire Tower tour. We also checked out a small portion of the nature trail on site. 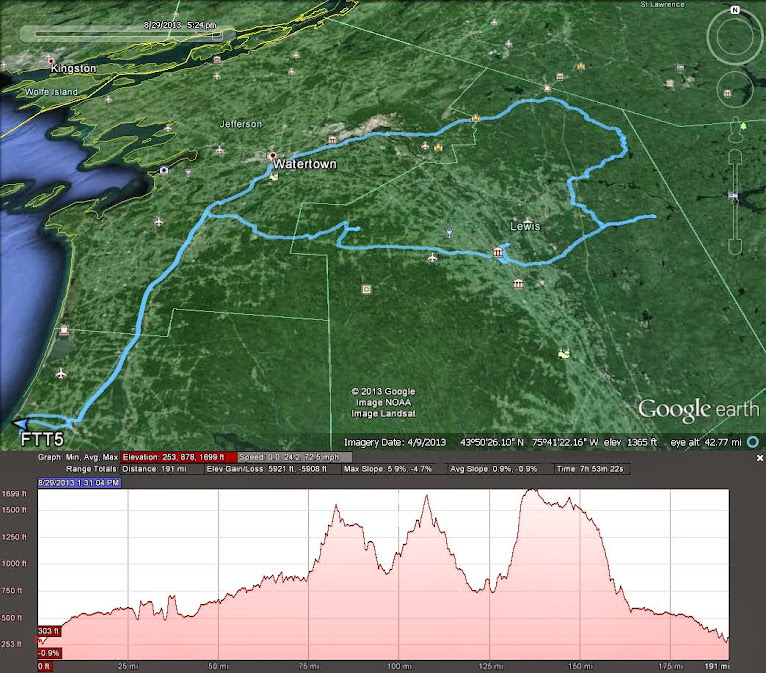 Once done, back in the car and heading to the Lookout State Forest, near New Boston, the last stop of the day. This was another of those old jeep trails that will take you most of the way. Turning onto the Lookout Trail, from Grant Road, at the top of the hill is a pull off to park. There was also a somewhat mowed path there going in the direction I needed, so we followed that. I had put the coordinates of the survery marker in my GPS, because I had seen that when the tower was there, it was about 30 feet away from the marker. You also need to be careful, because you’ll be right on the edge of private property. Try as we could though, with the grass and other stuff grown up as much as it had, 3 to 4 feet, we could not find any signs of a tower, but we did see what looked like an old fireplace. Maybe in the spring when the grass is down it would be easier to find. Well, it had been a long day, so we bushwhacked a more direct route back to the car for the ride home. Overall, 3 former sites, 2 relocated towers, and 1 cabin. To see all my pictures from today, click here.